Rev. Fr. 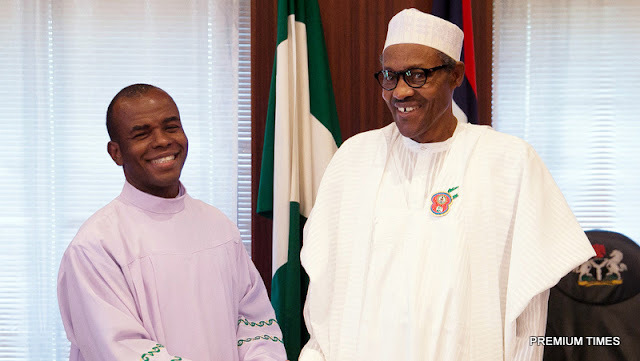 Ejike Mbaka has disclosed of his recent vision concerning President Muhammadu Buhari’s ailment. Mbaka, who made the revelation in one of his Adoration programmes, stated that several efforts he made to reach people close to Buhari over the vision had remained unsuccessful as they refused picking his calls. “Such people hate everything about the President”, he stated, while narrating the vision which he saw before the President’s present trip to London. According to him, in the vision, the President was critically sick and was being flown abroad for treatment. “His health was in a bad shape and he was asking that (Fr Mbaka) should pray for him. None among the people I have called, picked my calls. “People think I speak with Buhari everyday. When people climb into power, they are dazed. It is a long dream. Our job is to pray for him but there are things that he must do and there is no way to communicate it to him”, he said. He however prayed for him asking the congregation to rise up as they all prayed for the President.